Because I have a crazy addiction to reading novels, I decided to sign up to be a reviewer for Bethany House Publishing. Basically, you choose a genre you enjoy and they will send you books to read….for free in exchange for an honest review. Can I just say that this is the perfect arrangement for me? So this is the first book I received. 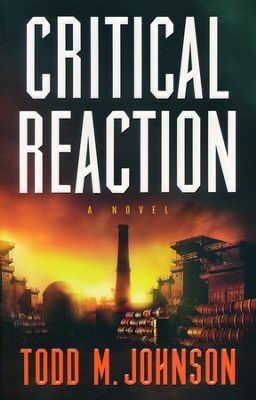 Critical Reaction, by Todd M. Johnson. This is not a book for a reader who enjoys an easy read. It is an intense story filled with details and characters that allow you to follow the trail all the way to trial. The story begins with an explosion at a nuclear facility, Hanford. A man who was in the explosion needs legal counsel and finds it in an old friend, Emily Hart. Emily is fairly new to practicing law and seeks out the help of her father, Ryan Hart who is a much more experienced attorney. Their relationship is strained at best, but Ryan Hart is desperate to win his daughter back. Todd M. Johnson does a great job at developing his characters. You definitely will find yourself rooting for Ryan and Emily. As the story moves along, there are surprises and twists that are unexpected but welcomed. I am typically a fast reader. However, with this particular novel I felt the need to slow down. The subject matter of a nuclear explosion is pretty tedious. I feel like Todd M. Johnson did a good job of making it entertaining. I don’t know if I would have ever picked this up in a book store without someone’s recommendation. I am very glad to have had the opportunity to read it.